KENSA will head down the M1 towards Richmond this week following another strong victory at The Gardens on Friday afternoon. Despite missing the kick slightly off box two, the daughter of Spring Gun and Little Bit Fancy was able to muster pace and find the lead down the back. Having worked hard to find the front, Kensa got a little bit tired in the run to the line but was able to hold on to score in a respectable 23.03. The win made it two from two for Kensa, the latest greyhound to hit the racetrack for Race A Chaser Syndications. Syndicate Manager Tatum Osborne Young said connections were very happy with her second up win. 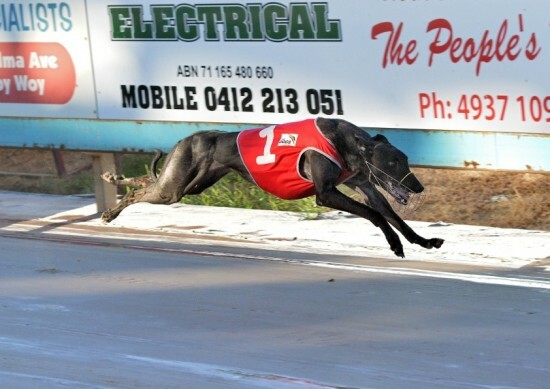 “While she didn’t go as fast as her 22.68 debut run, the style of the win was very impressive as she showed she has plenty of heart and doesn’t have to have everything her own way,” Osborne Young said. Trainer Jodie Manuel will now head to Richmond with Kensa to trial her at the track before potentially racing her there next week. All going well, Kensa will then have had a couple of looks at the circuit before the 2016 Richmond Riches Races series, worth $100,000-to-the-winner, which she is eligible for. The main feature race is held over the testing 535 metre trip, however Kensa will have plenty of time to work up to the distance, with the race not being run until May 2016. “It is very exciting to see how Kensa handles Richmond, with her early pace sure to put her in contention in a race such as the Richmond Riches,” Osborne Young said. For those wishing to be a part of Kensa, shares are still available. For more information of to purchase a share contact Tatum Osborne Young on 0429 090 683.